A Geographic Information System (GIS) provides a place for data integration, synthesis, and visualization. A GIS touches just about everything we do. Most companies use GIS as a mapping environment, sadly, which does not exploit the power of the software to inform and devalues effort. A map will show you “what” is present. A good GIS dataset can answer “why” you see what you do. Planning an effective GIS database is essential. 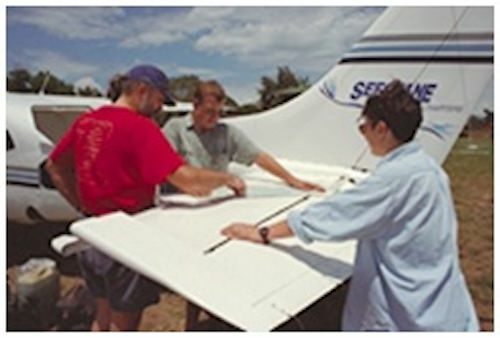 This often requires skill in a wide-range of data capture techniques. Real Time Kinematic GPS base station set up in developed and developing communities and countries. Land-based laser scanning surveys and point cloud data processing. Water surface and bed elevation surveys in lakes, rivers, and reservoirs. UAV surveys of elevation and orthophotography of the shorezone. Acoustic Doppler current surveys in more than 60 km of regulated rivers and assessment of hydraulic habitat under prescribed flows from hydroelectric dams. 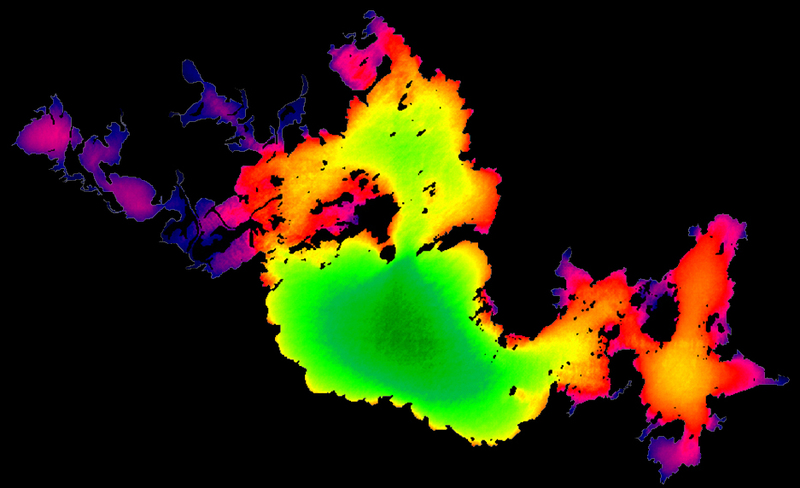 Depth and substrate mapping in small to large lakes (> 1,500 km of tracks). We operate watercraft approaching 20 ft. with 150 HP enabling work on large lakes, rivers, and reservoirs. We've operated boats frequently on large lakes including Lakes Superior, Nipigon, Winnipeg, and Malawi. We’ve worked near hydroelectric stations on many regulated rivers in Saskatchewan, Manitoba, and Ontario. Aerial video mapping of the coastal zone (> 2, 500 km), rivers and streams (> 1,500 km) in temperate, sub-arctic and tropical environments. Depth and substrate mapping using vertical bottom typing, side-scan, and with our partners, multi-beam acoustics. Mapping VRAP telemetry positions (90 sec.) of 13 lake whitefish for two weeks during the spawning period in a reservoir draw down experiment. Teaching advanced GIS and applied elevation modelling methods at the 4th year university level. Mapped the distribution of coastal habitat and fish biodiversity in Lake Malawi, Africa, and showed biodiversity patterns in the lake related to the tectonic structure of the basin. Created a digital GIS atlas for the World Bank called "A Biodiversity Atlas for Lake Malawi". 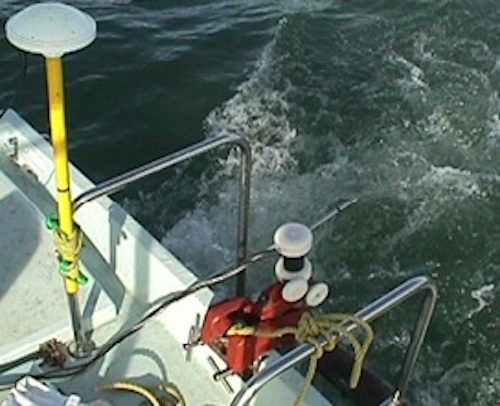 We possess an exceptional capacity to integrate aquatic, shore/coastal zone, and land data to assess drainage, flooding, and the effects of water level changes on people and the aquatic environment. Development of a 5-variable and 3-variable habitat suitability model for spawning lake sturgeon. Predicting the development and distribution of aquatic plant habitat over a 35-year timespan in a proposed reservoir. Development of planimetric water level variation models to map the intermittently exposed zone below a hydropower station. Assessment of hydroelectric generating station operations to strand fish by identifying stranding habitat in shallow water, and simulated options for earthwork mitigation. Water level and wave action models to predict the quality and distribution of fish habitat in reservoirs. Instruction on GIS-based soil loss modelling at 4th year university level. Rendered animations of flooding for a proposed reservoir with and without forest harvest. 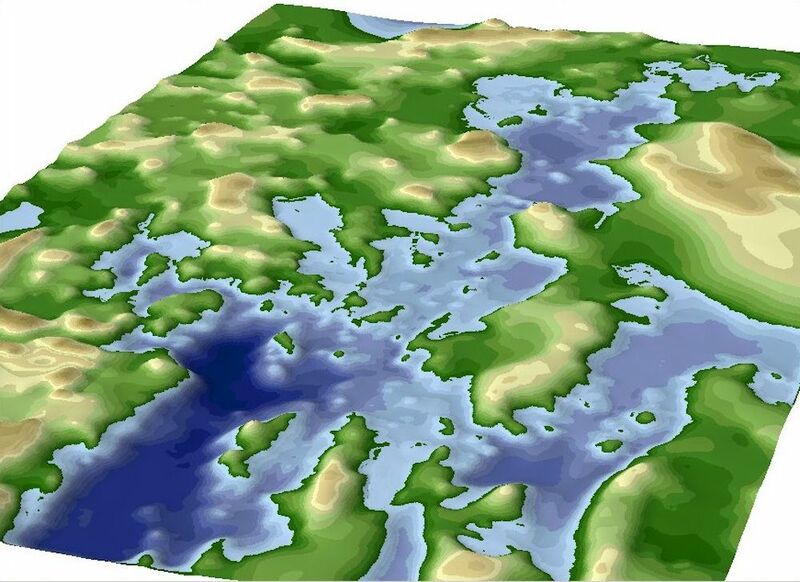 Rendering of Lake of the Woods, Canada, from aquatic, terrestrial, and satellite data. Precicting exposure, the circular integral of fetch.